Its construction was announced back in 2003, but opening game took place over a decade later. But when it finally opened its doors, the stadium was declared (by some) the most modern ground in all of Benelux. May 2003 saw the presentation of early renderings and at that point Ghent mayor announced opening for mid-2006. But with no agreement between the city and private investors representing KAA Gent on future use of the stadium plot in southern Ghent, nothing happened. Inauguration was rescheduled for mid-2007. But it wasn’t until early that year the demolition of local warehouses began. Construction again failed to start as nearby hospital authorities expressed concern over potential impact. An agreement with the hospital was reached at the time of planned opening. Building permit came in January 2008, but it wasn’t until September 2008 that preparatory work began. And again no actual construction happened as financial insufficiencies became apparent. 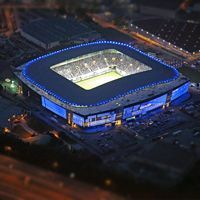 The final agreement between the city, KAA Gent and Ghelamco developers came in June 2010 and work was restarted, seeing actual construction proceed from 2011. Once it took off, the stadium was delivered in just over 2 years, ready for opening in mid-2013. And despite not having a solid safety certificate until October, the stadium has been in use since July. When presented in 2003, the idea of Bontinck architects seemed very futuristic as it was the first such attempt at combining a stadium with an office building. But as years went by with minor progress in Ghent, similar mixes became a standard rather than innovation. Still, despite the decade-long delay the stadium is very modern and most importantly the vision seems as feasible now as it did then. Called Arteveldestadion while under progress, the ground now has a naming rights contract with Ghelamco and is the main office for Optima Financial Planners. Though it has to be mentioned both organizations contributed to it being built in the first place. Capacity just under 20,000 seems well planned for KAA Gent and is possible to expand in the future, while corporate zones at the main stand and above regular seats have no match throughout Belgium, giving KAA a decent handicap to build upon. There’s also the road accessibility and very decent parking infrastructure (1,500 bays just outside and 4,000 more with shuttle transport). It should also become Belgium’s most ecological stadium with use of heating and matchday lighting optimized, rainwater collection system and a large surface of solar panels (13,000 sqm, to be installed atop the ground).